The death of Robin Williams was an American tragedy, both because our love for him was so strong and because the cause was so preventable. I say that as a counselor’s husband, as someone who understands the depth of mental illness and the difficulty in addressing it. So I don’t take Williams’ problems lightly, I just believe that there were therapies, medications, and professionals out there who could have helped him, and I’m sure some them tried, I just wish it had been enough. He was our great comedian, a once-in-a-lifetime talent who could do it all, who could make anyone laugh, and who simply had a natural gift for acting. He was funny beyond description, but could also turn that and his own demons into something stronger still. Mrs. Doubtfire may be the perfect example of that, a film that is wondrously entertaining but also showcases great heart. 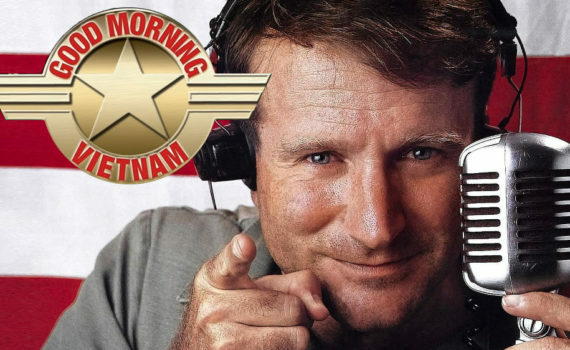 And six years earlier, Williams gave us Good Morning, Vietnam, one of his earliest films, and definitely one of his finest. Wacky and wild DJ Adrian Cronauer, also an airman in the United States Air Force, is transferred from Crete to Vietnam, where his unorthodox yet hilarious radio programming has been noticed and demanded. Cronauer was one of the most popular DJs in the military, alleviating the stress of the troops, bringing original content to the air, and cracking jokes like a man born to the craft. Vietnam was an escalating war zone, and tensions were rising every day, with promises of increased troop movements on the horizon. Cronauer started a cult following of his morning show, though army brass wasn’t so hot on his irreverent style and frequent rule-breaking. Falling in love with the country and its people, Cronauer began to find it difficult to draw the line between soldier and human, between job and passion, and as real war broke out, he found himself dangerously close to its middle. Robin Williams is a magician, a miracle worker, with his voice as his wand. The number of personalities he can invent on the spot, the characters he can bring to life spontaneously, the wit he can weave without becoming tongue-tied or breaking a sweat; it’s something that we’ll never see the equal of, which makes his passing all the more tragic. This film was the first time we were able to see that talent, but it wouldn’t be the last, Williams bringing the heat in film after film going forward, from Aladdin to Patch Adams, from Death to Smoochy to Good Will Hunting. It was his ability to layer jokes on top of real drama that was truly remarkable, and this film is a great example of just that. It may be a little dated now, but Williams is in his prime, and Forest Whitaker is a wonderful sidekick. The army antics are delightful, while the setting is so vibrant and true, creating a sense of something special, even after all these years.